Uncommon breeding resident and migrant in the Central Valley, Klamath Basin, Northeastern Plateau, Lassen Co., and Mojave Desert. Very limited breeding reported from Lanfair Valley, Owens Valley, Fish Lake Valley, and Antelope Valley (Bloom 1980, Garrett and Dunn 1981). Breeds in stands with few trees in juniper-sage flats, riparian areas, and in oak savannah in the Central Valley. Forages in adjacent grasslands or suitable grain or alfalfa fields, or livestock pastures. Bloom (1980) estimated 110 nesting pairs, and a total population of 375 pairs, in California. In southern California, now mostly limited to spring and fall transient. Formerly abundant in California with wider breeding range (Grinnell and Miller 1944, Bloom 1980, Garrett and Dunn 1981). Decline resulted in part from loss of nesting habitat. Feeding: Eats mice, gophers, ground squirrels, rabbits, large arthropods, amphibians, reptiles, birds, and, rarely, fish (Brown and Amadon 1968, Dunkle 1977). Soars at low and high levels in search of prey. Also may walk on ground to catch invertebrates and other prey. Catches insects and bats in flight. Cover: Roosts in large trees, but will roost on ground if none available. Reproduction: Nests on a platform of sticks, bark, and fresh leaves in a tree, bush, or utility pole from 1.3 to 30 m (4-100 ft) above ground. Nests in open riparian habitat, in scattered trees or small groves in sparsely vegetated flatlands (Bloom 1980). Water: Usually found near water in the Central Valley, but also nests in arid regions. Water needs probably met from prey. Pattern: Typical habitat is open desert, grassland, or cropland containing scattered, large trees or small groves. Activity Patterns: Yearlong, diurnal activity. Seasonal Movements/Migration: Migrating individuals move south through the southern and central interior of California in September and October, and north March through May (Grinnell and Miller 1944). Some individuals migrate as far as South America, passing in large flocks over Central America (Brown and Amadon 1968). Home Range: In Utah, breeding home ranges of 3 pairs averaged 4.2 km² (1.6 mi²), and varied from 3.1 to 5.4 km² (1.2 to 2.1 mi²) (Smith and Murphy 1973). In Wyoming, the distance separating 17 active nests averaged 1.8 km (1.1 mi), and varied from 0.6 to 2.9 km (0.4 to 1.8 mi) (Dunkle 1977). Home ranges of 5 pairs averaged 2.5 km² (1 mi²), and varied from 0.7 to 4.3 km² (0.3 to 1.6 mi²) (Craighead and Craighead 1956). Territory: Bloom (1980) reported 3 territories within a 1.1 km (0.7 mi) length of riparian habitat in the Central Valley. Reproduction: Breeding occurs late March to late August, with peak activity late May through July. Clutch size 2-4, usually 2 or 3 eggs. Incubates 25-28 days (Beebe 1974). Craighead and Craighead (1956) reported fledging success of 0.6 young per pair. N iche: May be preyed upon by golden eagles. Competitors for food include northern harriers, red-tailed hawks, black-shouldered kites, burrowing owls, and golden eagles (Craighead and Craighead 1956). Bent, A. C. 1937. Life histories of North American birds of prey. Part 1. U.S. Natl. Mus. Bull. 167. 409pp. Bloom, P. H. 1980. The status of the Swainson's hawk in California, 1979. U.S. Dep. Inter., Bur. Land Manage., Sacramento. Proj. W-54-R-12, Job II-8. Final Rep. 42pp. Brown, L., and D. Amadon. 1968. Eagles, hawks and falcons of the world. 2 Vols. Country Life Books, London. 945pp.Cameron, E. S. 1913. 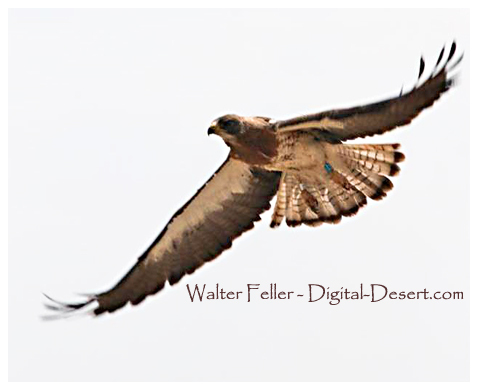 Notes on the Swainson's hawk (Buteo swainsoni) in Montana Auk 30:167-176, 381-394. Craighead, J. J., and F. C. Craighead, Jr. 1956. Hawks, owls and wildlife. Stackpole Books, Harrisburg, PA. 443pp. Dunkle, S. W. 1977. Swainson's hawk on the Laramie Plains, Wyoming. Auk 94:65-71. Garrett, K., and J. Dunn. 1981. Birds of southern California. Los Angeles Audubon Soc. 408pp.